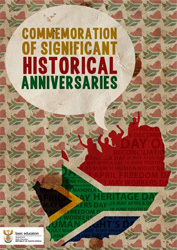 I am pleased to bring to you the 2012 “Commemoration of Significant Historical Anniversaries” booklet that chronicles our historical anniversaries. Perhaps, it is apposite to first make the point as to the importance of history in contemporary South Africa. Among one of the great leaders in our continent is Sir Seretse Kgama, the first President of Botswana who agitated for codification and reverence of a nation’s past. He is often quoted to have said “a nation without a past is a lost nation and a people without a past is a people without a soul”. That is, to have a past, to know about that past and celebrate it completes us in some way as humans. Celebrating and commemorating our past is one way of building collective memory and consciousness and thus build social cohesion. The report of the Working Group on Values in Education entitled “Values, Education and Democracy” emphasised the immense value of history teaching and the nurturing of historical consciousness, This report laid the foundation on which was to be inaugurated the South African History Project which aimed to promote and enhance the quality and status of the learning and teaching of history in our schools. Following on these earlier initiatives, we have compiled the 2012 booklet on historical anniversaries. Celebrating people and events of historical significance in our journey to freedom and democracy in this country is an important platform to build a common identity and chart the way forward to a cohesive society. Through the commemoration of key historical events that contributed to shaping our democracy,the Department of Basic Education aims to create the space to reflect, appreciate and learn from our challenges and achievements of the past. This booklet therefore, is intended to assist schools to utilize effectively the opportunity created by public holidays and national events. The booklet aims to inculcate in young people appreciation for the history and heritage of our country while fostering respect for constitutional values, human rights, diversity and symbols of our nation. The activities in the booklet provide assistance to schools to organise and participate in commemorative anniversaries by providing insight into their historical significance and providing recommendations for activities. The activities proposed are aimed to foster dialogue and to give real expression to Unity in Diversity. Provinces are therefore encouraged to use opportunities provided and use national days to engage learners, teachers and School Governing Body members in meaningful activities to celebrate these days. Schools are encouraged to include these days in their work plan for the year. However, the commemoration need not be limited to these days only. Schools could also draw on the community and other organisations to enrich their programmes. Key people responsible for the activities could also include local government, provincial government and Members of House of Traditional Leaders. This booklet captures those defining moments in our nation’s history, as well as the players and issues at play. Unlike other learning resources, this booklet is plainly written and is meant to actively engage the reader. It therefore has relevant activities for the classroom, some of which can be done in a group work situation while some require solo effort. In places, the educator may have to organise visual representations as part of the lesson plan. I hope you will find this booklet intellectually stimulating and that you will help us in your own way in reimagining our past so that we can continue to learn valuable lessons from that past.